Class credit is what you receive for taking a course in college. Credit is used to measure if enough hours have been completed for you to be eligible for graduation. 3 credit hours (1 course) = 3 hours in class per week = 6-9 hours study time per week. Click on this link to calculate how many credit hours you're willing to take each semester before you enroll in classes. Most coaches and athletes suggest you take 15 credits a semester instead of the minimum 12 credits. Why? If you fail one class in a 12 credit semester than you will end up only completing 9 out of the required 12 credits and will therefore be ineligible to compete immediately. If you take 15 credits you allow yourself some space in case you mess up on your grades. Always schedule your hardest classes on the offseason. This doesn't mean you should take more classes during the offseason. 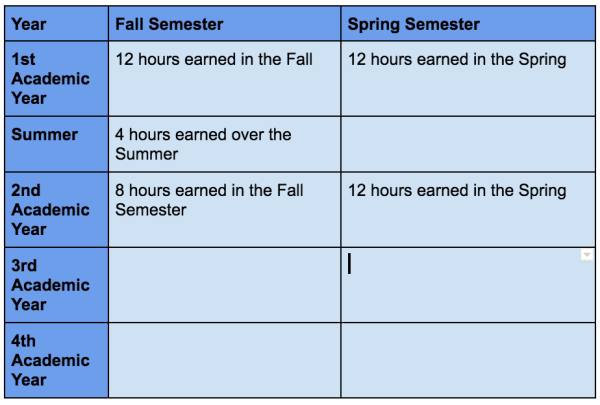 You should consistently take the same number of credits each semester, but consider scheduling those that are hardest for you during the offseason. Hire a tutor if necessary to help you get through your classes more quickly and easily. To compete, a student must be enrolled in a minimum of 12 institutional credit hours. At least 9 hours must be at the NAIA institution. Maximum 3 hours may be from another institution (with prior permission from registrar). If a student drops below 12 hours at any time, student must immediately stop competing. 24 hours during the student’s previous two semesters, or 36 hours during the student’s previous three quarters. Any non-term hours must be earned after the student’s 2nd most recent term. Notice in the chart above, the student athlete took 12 credits their Fall semester and their Spring semester. In order to be eligible to compete in their second academic year they had to take 4 credits over the Summer to abide by the 24/36 hour rule. For this reason, it is suggested that you take 15 credits every semester so that you can avoid Summer classes, ensure your eligibility in case you fall behind in one class and have the opportunity to graduate in 4 years with the option to compete during a 5th year. Repeat courses previously passed with a “D” or better in any term, (including summer, non-term) cannot count towards 24/36 hour rule. One repeat course/term previously passed with a “D” may be counted towards 12 hour enrollment rule.